I am often asked questions about anatomy by my patients, many of whom know about my profound interests in paleontology and evolution. Many of their questions regard their jaw joint called the temporomandibular joint, or simply TMJ. Discussions often lead to the TMJ’s interesting proximity to the ear, being directly in front of it. Curiosity usually peaks when discomfort arises within the ear or the TMJ, which can often be difficult to localize for patients when they are in pain. In fact, many patients have their ears examined before suspecting that their pain is arising from their TMJ. I thought it would be interesting to initiate a series of posts on my blog pertaining to the evolution of various structures relating to dentistry and anatomy. So, let’s discuss the evolutionary relationships between middle ear and the TMJ. 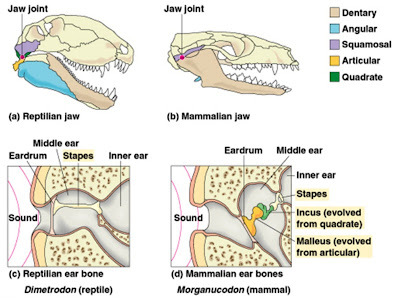 One of my favorite evolutionary transitions is the spectacular modification of the jaw joint for chewing in primitive reptiles and mammals into the middle ear for hearing in modern mammals like us. Yes, you read that correctly! The primitive jaw joint became a part of our middle ear. It’s important to begin by noting that all mammals (like cats and dogs, lion and tigers, and you and I) share a common ancestor with reptiles (like crocodiles and snakes, and dinosaurs and birds). As you know, mammals have hair, fur and mammary glands, the latter used to nourish their young. But those physical characteristics don’t survive when their remains are fossilized. Only the bones and teeth do. Using those fossilized remains, we can trace back in time the relationships of mammals and reptiles to where their lineages converge with a common ancestor. That was about 310-330 million years ago. From that point on, changes gradually occurred through evolution that allow us to distinguish differences between mammals and reptiles. A prime example is our discussion concerning the jaw joint and middle ear. 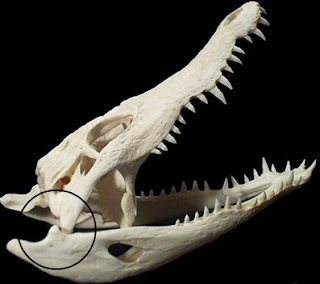 In amphibians, reptiles and birds, the eardrum (tympanum) is a circular, thin membrane located behind the jaw joint. Sound is transmitted via the eardrum to the middle ear in the form of vibrations conducted along a small bone called the stirrup (stapes). In primitive amphibians, a bone called the hyomandibula helped to brace the upper jaw against the skull (the suspension-system in all animals is called the suspensorium). In order for our amphibian to fully migrate to land and evolve into a reptile (living and reproducing solely on land), it had to evolve a more sophisticated sound receptor within the middle ear, along with other numerous terrestrial modifications, since air has 3,600 times greater acoustic impedance than water. So, the hyomandibula of the upper jaw “migrated” through evolution to the middle ear and became the reptilian stapes to enhance auditory reception. But, that wasn’t all that was evolving! In modern mammals, sound is transmitted from the eardrum to a set of three tiny bones within the middle ear called the auditory ossicles. They are the hammer (malleus), anvil (incus) and stapes (same as the reptilian stapes). Here’s the Big Question: How did we go from one reptilian, middle ear-ossicle to three in mammals? Primitive reptiles had a jaw joint that consisted of two-bones called a quadrate-articular joint (Q-A). In mammals the Q-A joint was replaced by another two-boned jaw joint called the dentary-squamosal joint (D-S). The D-S is our jaw joint. We refer it as our TMJ or temporomandibular joint. What happened to the reptilian Q-A joint when we evolved into mammals? 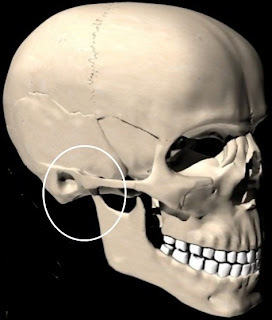 Here’s the Big Answer: The primitive quadrate-articular bones of the Q-A joint moved into the middle ear and became the incus and malleus auditory ossicles. That gave us three ossicles in the middle ear, all for improved hearing on land. It also left us with a D-S joint that was more flexible for chewing that the reptilian Q-A joint. Hearing, protection and chewing, as you can imagine, are fundamentally critical traits for survival. More on that later. Notice the reptilian jaw joint in this crocodile. It is formed from two bones: the quadrate and articular. Our croc has only one auditory ossicle, the stapes. Notice our mammalian jaw joint. It is formed from two bones: the dentary (also called the mandibular) and squamosal (also called the temporal). 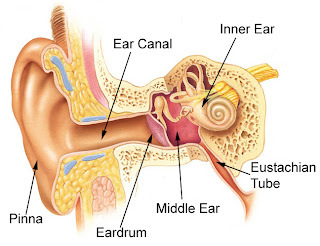 We have three auditory ossicles, the maleus, incus and stapes. Another way to look at it would be that mammals required better hearing ability on land. They needed three bones in the middle ear, not the reptilian two. So, the reptilian joint (its two bones) migrated to the middle ear in mammals to join the stapes (which was already there). and the incus and maleus was the reptilian jaw joint. The evolutionary and anatomical relationship of our jaw joint to our ear explains why we hear our jaw movements so loudly when we chew, and why our present jaw joint is located so close to our ear. In fact, within our middle ear there are actually tiny muscles and nerves that “belong” to the original jaw bones. About two hundred million years ago, with their higher rates of metabolism and improved means of locomotion, mammals began expanding into ecological niches far beyond the capacity of reptiles. The mammal’s ”new” jaw joint provided for a wider range of motion for chewing, and their new-and-improved middle ear provided greater hearing acuity. These evolutionary changes occurred through the process of natural selection. This is the process in nature whereby only the organisms best adapted to their environment tend to survive and transmit their genetic characteristics in increasing numbers to succeeding generations, while those less adapted tend to be eliminated. Those organisms with greater fitness have a better chance of survival and reproduction. A truly incredible tale of dental evolution!